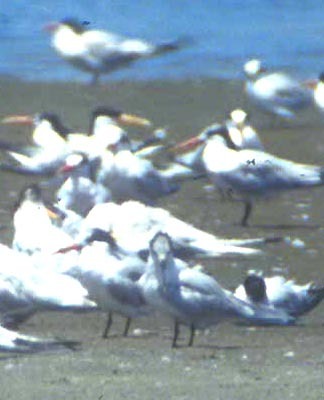 The photos (above) show the Sandwich X Elegant Tern hybrid (just right of center in front row) at the Pajaro River mouth, Monterey Co., in July 1995. In the second (righthand) photo it is facing us and showing its white forecrown and black bill with yellow tip. Tern and strongly suggests that it is a hybrid, likely born at Bolsa Chica ORA in summer 1993. The SANDWICH TERN is an exceptional vagrant to California but a very few have been located with Elegant Terns in coastal California. Elegant Tern has undergone a significant range expansion in recent decades, first in San Diego Co. and then north to Orange County. A Sandwich Tern appeared in the San Diego Bay colony in 1980, 1982, 1985, and 1987, and what may have been the same adult appeared in the Bolsa Chica colony in 1991 and each summer thereafter. This Bolsa Chica tern paired with an Elegant and likely laid eggs in 1993, 1994, and 1995. 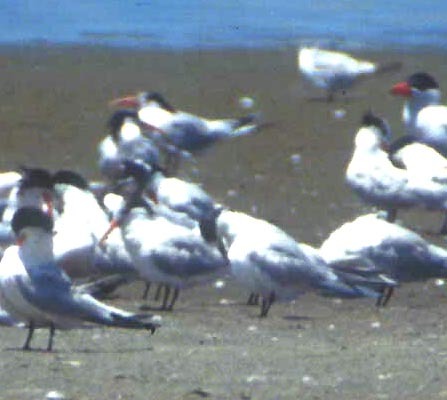 An apparent hybrid Sandwich X Elegant tern was at the Pajaro R. mouth, MTY/SCZ, in July 1995. That individual was in at least its second summer (per Claudia Wilds, in litt. to author, after I sent her a set of photos) and thus seems to have been the result of the Bolsa Chica hybrid pairing in 1993. 7/5&7/95 Pajaro R. mouth MTY/SCZ hybrid SATE X ELTE; second-summer bird; details & sketch in notes, distant photos. The tern roost was on an island on the MTY side of the river, but the flock flushed and relanded several times, and occurred over SCZ airspace several times. Sandwich Tern in Elegant Tern colony, salt works, south San Diego Bay. This bird had been reported by others in such widely separated spots as San Elijo Lagoon, San Diego R. mouth, and Tiajuana R. mouth within the last 1 1/2 weeks, but was not refound at any of these spots in subsequent days and I failed to find it at any of these spots (all checked) today. In late afternoon (about 5 pm) Elizabeth Copper, Richard Webster, and I checked this restricted area where a Sandwich Tern had occurred in May 1980. Although we had no effect on the birds in the Elegant Tern colony, the Sandwich Tern was very flitty -- either constantly being harassed by Elegants or tilting its head up and snapping at landing birds. Within minutes, it would get up and fly to another pod of Elegants,. Sometimes we picked it up in flight with binoculars by the small size and very white flight appearance, but the only really useful views were obtained at 40-45X with the scope, which was shared by the three of us. Even when we knew where it was, it could disappear from view among the densely-packed Elegants. Elizabeth went to call other birders and the bird promptly got up and flew off. Within an hour, Elizabeth had returned with Guy McCaskie, Dennis Parker, Jerry Oldnettle, Dave Povey, and Bart Cord. It took another 20-40 minutes of search before the bird was refound in the original clump of terns and all got to see it. Since there were unconfirmed reports of the bird in May 1981, we speculate this bird could be the same tern returning for its 3rd spring. If so, it remains responsible for the first and only state record to date. See the family page for county abbreviations. All photos & text © 2003 Don Roberson; all rights reserved. Readers may use this material for their own private enjoyment, study, or research but none of the photos or text herein may be used commercially nor may they be reposted on other web sites without written permission. All material is copyrighted. The posting of photos and text on this private web site is not a submission to review organization but blanket permission for use of descriptions by North American Birds editors in their research is granted, and serious researchers in general are granted permission to use the records cited herein.